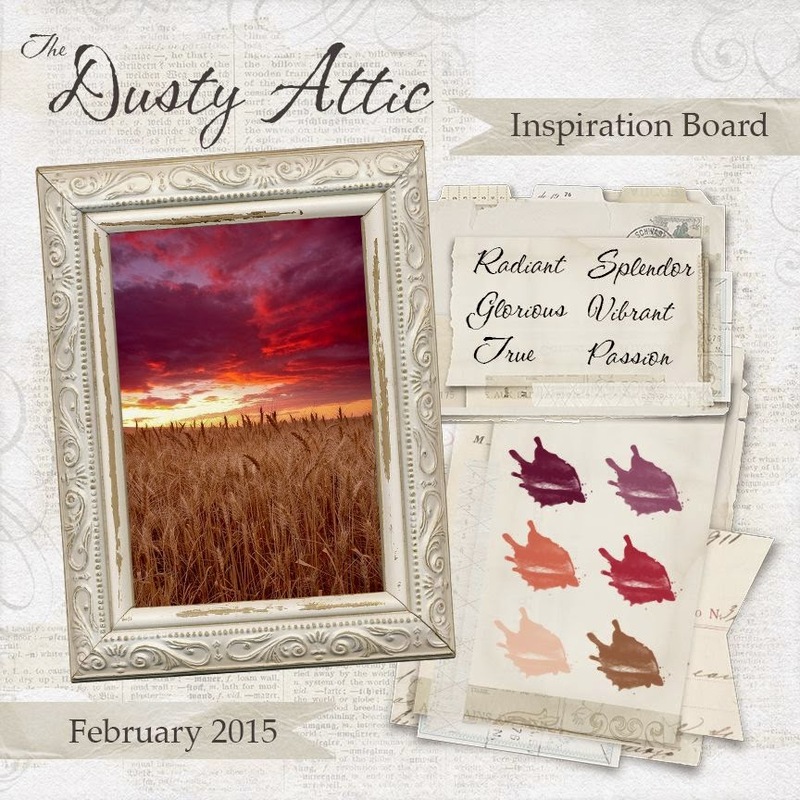 Dusty Attic Mood Board . I am absolutely loving these rich colors . The colors, the words and generally how you feel . 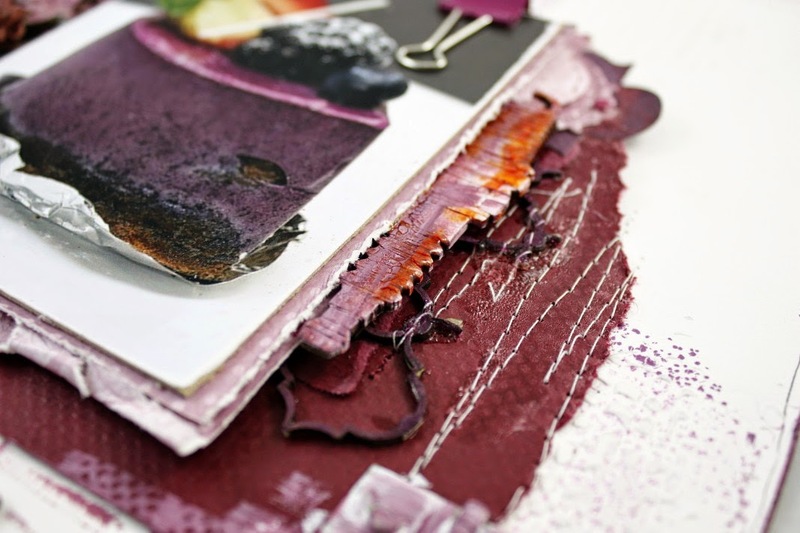 The mood board is flexible and you may interpret how you feel or as the mood takes you . If desired White , Black, and Kraft cardstock can be used for your backgrounds . The only requirement is that Dusty Attic chipboard must be used in your creation . and placed them around and under the photo. 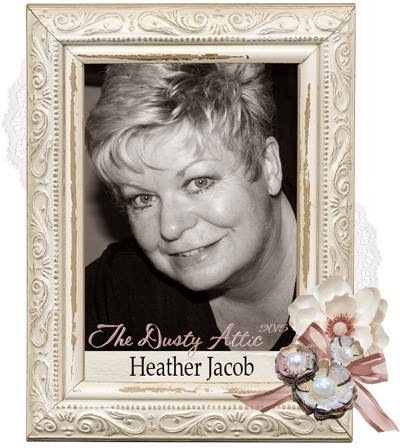 Oh my word Heather - this is gorgeous! Every inch delish! And that plate of yum there looks totally sinful! BERRY is a tough color for me! You did an awesome job with it! You ALWAYS ROCK the COLORS!! This is sooooooooo gorgeous! LOVING the colors!!!!!!!!!! Wow, look at those gorgeous rich colours! Everything on your lay-out blends together just perfectly. This is stunning! Super intens!! M'encanta com pot arribar a jugar només amb dos o 3 colors! Wow...what an amazing page...and the photo is yummylicious. Beautiful texture and layers. Absolutely & totally LOOOOVE.....& the way you've used the tag is simply stunning:):) GORGEOUS page:) Now...can I EAT THE DESSERT?????!!!!!!!!!!!!!!!!!!!!!!!! This is so beautiful, Heather! The colors are so rich and gorgeous! A simply stunning piece! Oooh, ! I just could eat this beautiful layout! Wonderful! Wonderful! 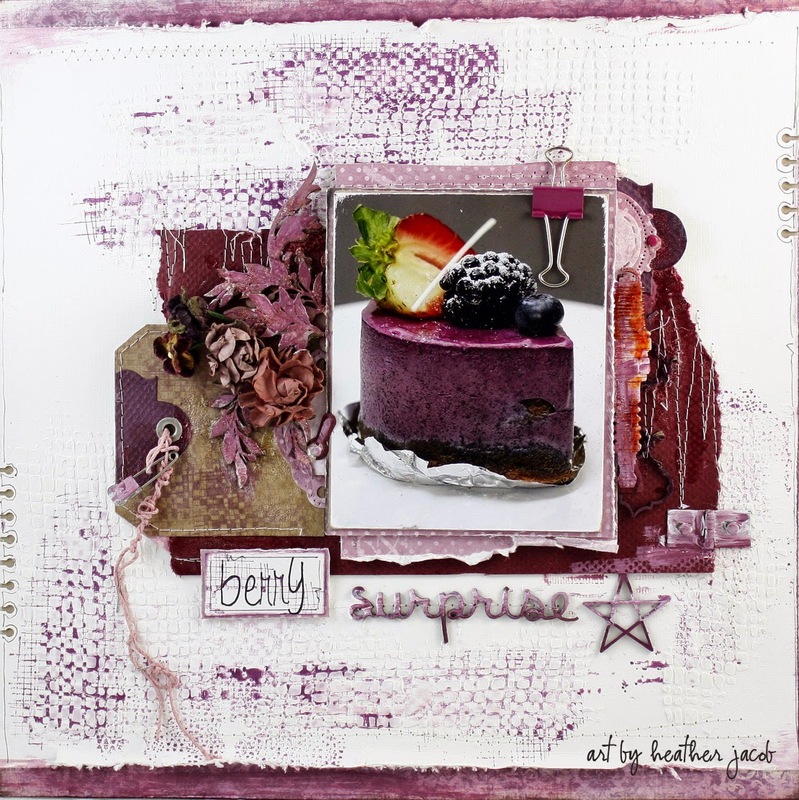 Fantastic berry colours and I just love what you did with the tag and how you incorporated it into the whole piece! Oh yum.... not just the photo but the whole layout! 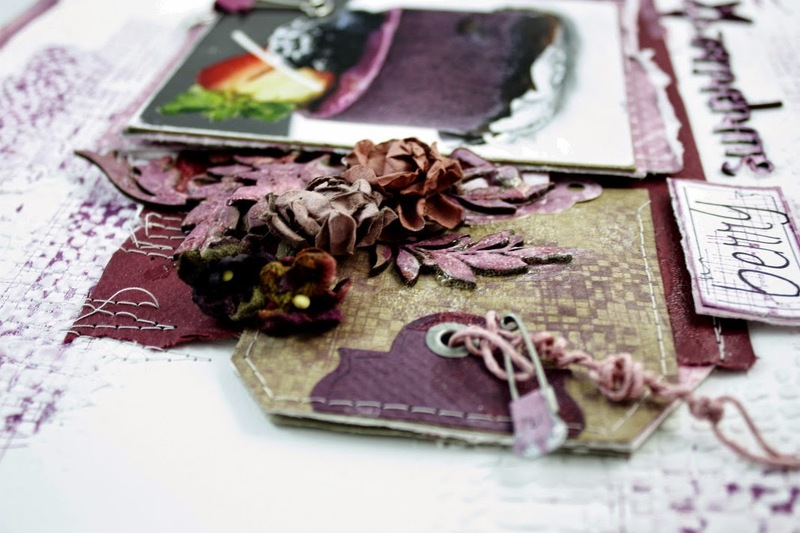 These colors suit you so much.. really love the details.. the stitching.. and the texture stamping on your backgrounds... beautiful layout..
Another cracker from the studio of Miss Heather. Every tiny detail is perfect....good enough to eat !!! love every detail as usual! Color is fabulous! 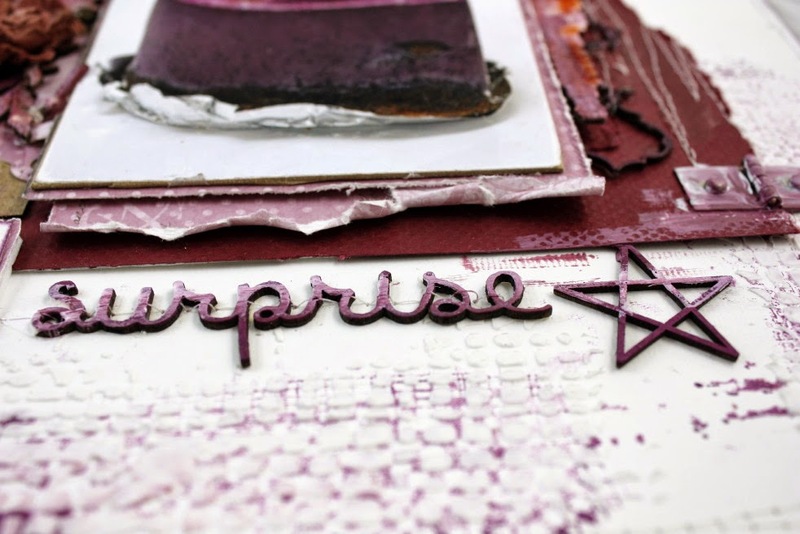 the ombre effect on your chipboard is to die for! What a yummy page!!! The color is so great - and all your details and embellishing is perfect as usual! Ispiration at it´s best.